﻿ Macintosh vs Windows icons - What are the differences? • What are the differences between Windows® and Macintosh® icons? What are the differences between Windows® and Macintosh® icons? Microsoft Windows® and Apple Macintosh® icons are very similar. They both have several image formats embedded in the same icon. But the file format is totally different. You cannot use Macintosh® icons as is under Windows®. The file format is not compatible. You must convert them to Windows® ICO file format (with Axialis IconWorkshop™ of course!). This is the same under Macintosh® OS which cannot read Windows® icon files. Axialis IconWorkshop™ supports the following Macintosh® icon files:ICNS, RSC and BIN. You can easily open them into the Icon Editor and save them as Windows® ICO format. During this operation, we recommend you to remove special Macintosh® formats which are useless under Windows®. You can also read a Windows® icon and save it as Macintosh® format. Some image formats are unavailable in Macintosh® icon specifications. Therefore IconWorkshop™ won't event permit you to create them. If you try to save or convert a Windows® icon to Macintosh®, some format will be removed. Note that all image formats can be created in Windows® icons, even custom formats not listed above. • Recommended: 128x128 (RGB/A), 48x48 (RGB/A, 256 colors, 16 colors), 32x32 (RGB/A, 256 colors, 16 colors, mono), 16x16 (RGB/A, 256 colors, 16 colors). • Minimum: 48x48 (RGB/A, 256 colors), 32x32 (RGB/A, 256 colors), 16x16 (RGB/A, 256 colors). • Recommended: 256x256 (RGB/A), 128x128 (RGB/A), 48x48 (RGB/A, 256 colors, 16 colors), 32x32 (RGB/A, 256 colors, 16 colors, mono), 16x16 (RGB/A, 256 colors, 16 colors). • Minimum: 128x128 (RGB/A), 48x48 (RGB/A, 256 colors), 32x32 (RGB/A, 256 colors), 16x16 (RGB/A, 256 colors). The 32x32 Monochrome format is recommended for Macintosh®icons to ensure display compatibility on old Macintosh®systems with B/W screens. Macintosh® icons can be saved using two different file formats: "ICNS" and "RSC" (or "RSRC" is used). 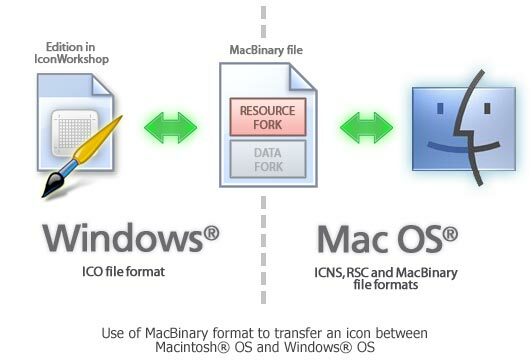 A third format MacBinary "BIN" is used for transfer purpose between Windows® and Macintosh®. ICNS - This is the standard Macintosh® icon file format. Only one icon (with several formats) can be saved in this format. This format is the most commonly used. RSC or RSRC - This is the Macintosh®resource file format. It is used mainly by developers. This format can contain several icons. Axialis IconWorkshopä support reading of RSC files with several icons but can write only RSC files with one icon. BIN - MacBinary format. This format permits to easily transfer files between Macintosh® and Windows®. For more information on this format, visit this website: http://en.wikipedia.org/wiki/MacBinary . We strongly recommend to use this file format to transfer your icons to Macintosh® because it is compatible with Macintosh® file system which separate each file in two parts called "forks": The data fork and the resource fork. The data fork contains the data included in the file (a text file for example). The resource fork contains the image or icon which permits to display it on screen. See below for more information on transfer from Windows® to Macintosh®. To transfer and icon between Windows® and Macintosh®, the easiest method is to use the MacBinary format. This format permits to generate an icon compatible with the Macintosh® OS forks. The MacBinary format permits to merge the 2 forks in one file handy for transfer, mail attachment or Web publishing. When IconWorkshopä saves an icon in MacBinary format, it writes the icon in the resource fork. The data fork is left empty. As a result, as soon as you receive or see the file in Macintosh®, the icon appears automatically. Then, you can handle it using the standard Finder/MacOS user interface. 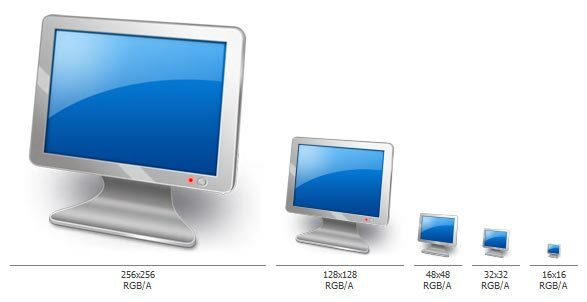 For reasons of compatibility with hi-res screens, Microsoft Windows Vista introduced a new format of icons supporting PNG compression and sizes up to 256x256. Axialis IconWorkshop can create PNG-compressed Windows icons up to 256x256. To read more about Windows Vista™ icons and how to create them using Axialis IconWorkshop, read this article: "Introducing Windows Vista Icons". For the same reason of compatibility with Hi-DPI screens, Microsoft included icons with larger image size (768x768) in the developer preview of Windows 10. But in the final Windows 10 build the large image size was removed from the icons. We decided to keep this image format in IconWorkshop for compatibility if the format is enabled to a future update. We also added the 512x512 format. Both are PNG-Compressed. The new Macintosh® OS version 10.4 (Tiger) introduces a new icon format which permits to create 256x256 icons. 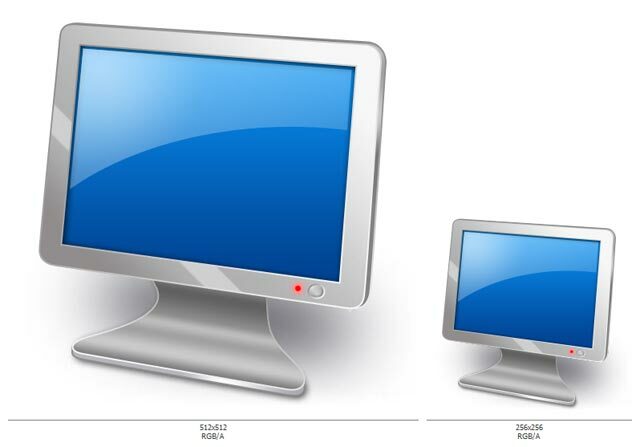 In the upcoming months a new generation of flat LCD displays will have much higher resolutions. The screens won't be larger but the number of pixels per inch (DPI) will increase. This will result in smaller items on screen including icons. To compensate this effect, Apple has planned to create a new resolution-independent user interface and the ability to display icons with higher definition in Tiger. This format is highly compressed and permits to create large 256x256 icons using less than 100 KB. The compression is based on JPEG 2000. This format is similar to JPEG but can include a transparency channel (Alpha Channel). However, JPEG 2000 has an additional option which permits to compress the image without quality loss (unlike JPEG which "destructs" the original image to increase the compression ratio). In OS-X 10.4 icons, the icons are compressed using this lossless method, keeping the original image quality. The resulting compression ratio is about 1:2 (similar to PNG). OSX version 10.5 (Leopard) introduces an extra large icon format which permits displaying 512x512 icons on Hi-DPI screens. This format uses the same compression format as 256x256 format for Tiger (see above). OSX version 10.7 (Lion) introduces an extra large icon format which permits displaying 1024x1024 icons on Hi-DPI screens. This format uses the same compression format as 256x256 format for Tiger (see above). However, it can be compressed as PNG as well.